Melodrama Meant Much, and Why Not? I've got this need to escape present time and show-go when it was immediate, and more so, communal. Laugh and the audience laughs with you, say many with regard comedy, but when melodrama played to crowds, it was mirth plus tears they shared, and gladly so. We lost that when everyone got smugly superior to performance, stage or screen, rather than surrendering to it. Do we at least cry where alone with a film that moves us? I wept at a recent and private sit through Now, Voyager, affected as much by WB craftsmanship, and Max Steiner music, as Bette Davis' romantic, then mean mom, travails. To blubber through a feature has cleansing value, the "good cry" called that for plenty good reason. People went to stage melodramas, and then nickelodeons, to let out emotion otherwise kept at bay. Now it seems we suppress at theatres and spill guts for venues more public and less appropriate (like social media, a too-oft indifferent, or harshly judging, host). At least there were darker places then to dab tears, or laugh uproariously, theatre-going a shared experience that still offered a kind of privacy. You were among a crowd, alone in your seat at least, and not penalized for feelings you'd experience. I lately watched and gathered evidence from two otherwise unrelated features, The Old Fashioned Way and The Spiral Staircase. Both are period set (late 19/early 20th, century) and have segments where an audience sees drama on a hometown stage (The Old Fashioned Way), or on a screen hung in a hotel parlor for entertainment of guests (The Spiral Staircase). Each convey a sense of how such entertainment was received by patronage long past. How wonderful it must have been to take drama on face value and let yourself be swept away. An age of innocence, perhaps of naïveté, but a night at the show could truly be one to remember, with no shaming for edge-of-seat you sat, or tears you shed. Release of what was pent up was primary goal of entertainment then. Getting above such basics would cost us a lot. The Old Fashioned Way features a re-staging of The Drunkard, a play introduced in 1843 at one of P.T. Barnum's theatres. Almost a century later (1933), The Drunkard was revived in Los Angeles and became a sensation. Something very old had become something preciously new again. People went to see The Drunkard over and over. Traditional seating gave way to tables where food and drink could be enjoyed. Crowds were encouraged to applaud virtue and hiss villainy. This was antiquity that 1933 had progressed far beyond, or had it? The twist was customers arrived to jeer but developing instead a real affection for The Drunkard and its return to a simpler, if more genuine, era. Lots re-saw their youth, devoted fans John Barrymore, Mary Pickford, Boris Karloff, and especially W.C. Fields (he attended the play thirty times) not so far removed from a time when The Drunkard and others like it were less object of gentle ridicule than drama taken straight. Fields wanted to celebrate The Drunkard and so incorporated the show and much of its cast into a major segment of The Old Fashioned Way, his own rear-view to stock companies and itinerant roads they traveled. Fields starred as a huckster but one step ahead of sheriffs, or landladies done out of room fare. This was a way Fields knew, had lived, and clearly had great nostalgia for, The Old-Fashioned Way close as any project to The Great Man's heart. The Old-Fashioned Way is in some ways a feature expansion on ideas Fields had explored in The Fatal Glass Of Beer. As third act highlight, The Drunkard is kidded, but not mocked. We know its time has passed, Fields not so blinded by sentiment as that, but he lets a recreated audience absorb The Drunkard on its own terms, responding in much the manner as mid-1850's viewers might have. They watch with rapt attention. A young couple find pleasure in not only the performance but the fact they are together watching it, a sweetly affecting moment. An elderly pair is even more caught up, the man's response to a tense moment causing his wife to warn, "Henry, remember your heart," that line done sincere and not to make fun of the two. A mother-love song inspires a son in the audience to look lovingly at the parent he has brought along. The Drunkard is received by this period audience as a thing authentic and moving, even as Fields the presenter invites us to laugh with, but not at, them. Here was theatre we are the poorer for having forfeited, The Drunkard and its audience a singular highlight of The Old Fashioned Way. The Spiral Staircase makes a similar gesture, but with then-newer technology, that of motion pictures circa the early teens. 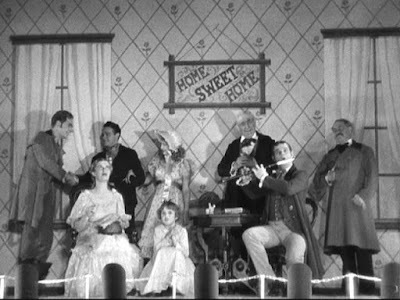 A gathered group is watching a one-reel drama presented for townfolk and hotel guests, the projector hand-cranked in a dark room to piano accompany. The film they see is not identified, but it is The Sands Of Dee, directed by D.W. Griffith and released in 1912. The Spiral Staircase is set around a same period. For this audience, movies are exotic in themselves. They react to the film's tragedy with handkerchiefs twisted and eyes that mirror intensity on the screen. This is what I would like to think real nickelodeon patronage experienced. Think of coming off the street for a five cent coin to emerge less than an hour later, wrung out from laughter, tears, often as not both. Of course the movies caught on. Naturally they swept competing entertainment to margins. Talking film finished the job of making film dominant. I suspect folks were fully invested in movies from the first one they saw, whether short, silent, or seen on a bed sheet. The Spiral Staircase does a beautiful job enacting what the fascination, and impact, was all about, even as the scene goes on and off within a minute, its purpose to portray characters oblivious to a murder committed on the floor above them. Consider it, then, a lovely pearl contained within generous oyster that is The Spiral Staircase (the feature GPS-visited here). Just a quick note to advise that today's post ranks among the finest of all Greenbriar entries. It is thoughtful and insightful... and original. You put your finger on how the movies caught on. 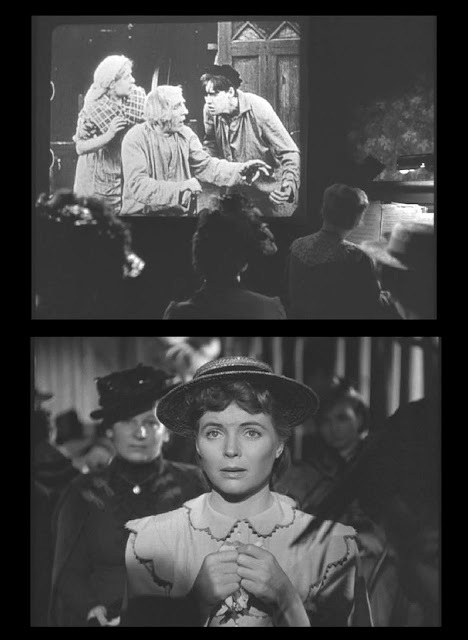 Contrasting the use of The Drunkard in THE OLD-FASHIONED WAY and the Griffith reel in THE SPIRAL STAIRCASE is very perceptive -- though one is an elaborate stage production and the other is a relatively new-fangled film presentation, the works within the films are essentially similar and fulfill the same function. What was it Sam Fuller said? "Film is like a battleground. Love. Hate. Action. Violence. Death. In one word: emotion." At any rate, something that audiences need. Expanded, this piece is fodder for a great chapter in a book about the power of drama... and the magic of the movies. Thanks, Griff. I had watched THE OLD-FASHIONED WAY about a month ago and those audience reactions stayed with me. Then came THE SPIRAL STAIRCASE, recently arrived on Blu-Ray, and the idea sort of crystallized. My guess is that THE OLD-FASHIONED WAY, and its tribute to THE DRUNKARD and melodramas like it, were very personal to Fields, his a dominant creative voice toward putting together the movie. Yes, an exceptional entry. I miss the notion of small scaled stage theaters--unmiked as well--that have a natural, intimate feel. The book "Town Hall Tonight" offers a great look at that world. And Gladys Hurlbut, an actress whose career ran to "The Andy Griffith Show" and beyond, wrote "Next Week East Lynne! ", a comic memoir about her youth in traveling stock companies. These day we tend to confine audible response to laughs and occasional cheers, but we're still suckers for skillful manipulation. Or even crude and obvious, especially if it involves a dog in pitiful straits. "Lady and the Tramp" has a scene of comical dogs in a pound howling out "No Place Like Home"; cutaways to sad, realistic dogs with a lone tear rolling down the muzzle make it heartbreaking. And of course we're always up for anger and outrage, real or fictional. Post an image of a man kicking a dog and you'll go viral. As a matter of fact, Donald, I am right now re-reading "Town Hall Tonight." It is a great book. One more OLD FASHIONED WAY footnote: While importing much of the stage cast, Fields took over the villain role from a very young Henry Brandon. Brandon found himself another villain role: Barnaby in the Laurel & Hardy BABES IN TOYLAND. OMG - this is one of your all-time best articles. Thanks much. We see these films largely with no idea of how they came together. I wondered why the cast of THE DRUNKARD was given special credit. Brandon made a mean Fu Manchu for Republic as well. What I like most about THE OLD FASHIONED WAY is that we get to see W. C. Fields The Juggler. He has a routine where he will let a cigar box drop by one foot, nudge it to send it flying while kicking out with the opposite foot so that our eyes go in to directions at once. I love that. He sneaks it into other films as well. One day I was standing on a Toronto subway platform when a fellow was kicking a cigarette package along. It slid right beside my left foot. I nudged it to send it flying while kicking out with my right foot dramatically a la Fields. The poor fellow's eyes went in two directions at once when he saw it. He completely melted, falling into a tantrum, shouting, hollering, raging. Fields would have loved it. I found that if, unlike most, I delivered W. C. Fields lines in my own voice instead of imitating his I got EXACTLY the same reaction of the person I delivered them to as Fields got from Grady Sutton, Franklin Pangborn or whomever. Ditto Groucho Marx by the way. Those Fields films are a gold mine for anyone wishing to study one of the genuine comic masters of all time. Ditto Chaplin,Keaton, Laurel And Hardy, The Three Stooges, et al. One of my favorites is when someone says to Fields, "I did what you said and it didn't work," to which Fields replies, "Next time don't do what I tell you, DO WHAT I TELL YOU!" Try it sometime in your own voice. It's a lulu. I never let a chance to pull that cigar box nudge pass. You shouldn't either. A bit off topic, but related to "a dog in pitiful straits." I learned at the last minute of a dog being graphically strangled in the 2014 horror movie THE BABADOOK; I popped out the DVD and tossed it out! Fiction it might be, but I'm still outraged! Phooey! THE BABADOOK is one helluva scary movie. Great post, John Are you aware there's a 1935 Poverty Row version of THE DRUNKARD starring the unfortunate James Murray of THE CROWD, a year before he was fished out of the Hudson River? It ran across it in a very old TV listing recently, though unlike a great many of these films it does not seem to be circulating in public domain outlets. Has anybody seen it? The James Murray version of "The Drunkard" was produced by the Weiss Brothers in 1935, and was incorporated into GASLIGHT FOLLIES (1945), the first production of Boston exchange man Joseph E. Levine. Levine, not missing any bets, also made the film available as four separate shorts: a roundup of silent newsreels narrated by M-G-M's John B. Kennedy; a compilation of clips with silent stars; "The Drunkard" (the only talkie footage in the film), with the stage villain Theodore Lorch in the Fields role of Squire Cribbs; and an abbreviated version of EAST LYNNE with Alan Hale, and tongue-in-cheek narration by Milton Cross and Ethel Owen. 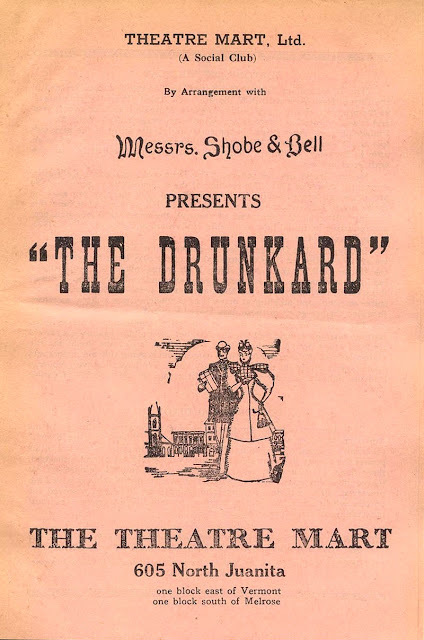 Incidentally, the original stage production of "The Drunkard" became a tradition in Los Angeles, where it played continuously from 1933 to 1959. Thanks, Scott! I also ran across GASLIGHT FOLLIES recently in old TV listings. Is "The Drunkard" based on "Ten Nights in a Barroom"? I downloaded a free copy of that on my Kindle, and no matter how over the top it seems now, it's depressing as hell. KEVIN K: Pretty sure they're two separate animals. Read some period plays decades ago; recall "Ten Nights in a Barroom" as being a series of vignettes about a barroom bringing ruin on its owner and its customers. "The Drunkard" is more conventional, with a definite hero, heroine, villain, and happy ending.